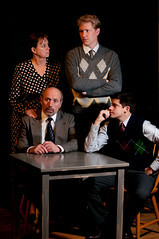 Jackie O'Keefe (Linda), Jeff Clarke (Biff), Jeffrey Adams (Happy), and Don DeMico (Willy) Star in "Death of a Salesman"
I feel very privileged to have the opportunity to direct what some believe to be the greatest American play ever written. Years ago, I had the chance to play the role of Biff in a local production. Now I have the chance to help an entire cast perform Miller's take on family and The American Dream. The show opens on February 26th at The Pear Avenue Theatre in Mountain View, CA. For tickets and more information go to www.thepear.org.